About The Artist: In December of 1992, Sue was a Special Agent of the FBI in the San Francisco Division. When her daughter Jamie was born, Sue took a few months off to enjoy motherhood and lots of hilly walks. She also took out her guitar and sang and played for Jamie. She sang songs she remembered from when she was a child, songs from youth group, and lots of folk songs. In fall 1993 after 13 years as an agent, Sue decided to turn in her badge and move to Boulder, Colorado with her husband and Jamie. She also decided she wanted to go “back to music” and start a children’s music business. That was great news to Sue’s Mom, a former librarian, because Sue had sung at her Mom’s library in Malden, Massachusetts, over 25 years ago. In the summer of 1994, after a lot of research and practice, Sue contacted local preschools and began doing shows. In September 1994, soon after the birth of Becky, Sue began teaching a music and movement class one evening a week at Parenting Place in Boulder. After a few months she added a day class and then more classes, and became known as “the music lady”, “Miss Sue”, “the music teacher”, and of course, “Jamie and Becky’s Mom”. 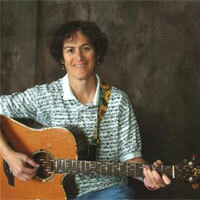 Now, Sue is well known throughout the Boulder-Denver area as a singer, songwriter, guitarist, and teacher who specializes in music for young children and their families. She was the founder and director of Boulder County?s Community Music School, a non-profit organization which offered classes, concerts, and other programs for infants, and children through age eight.